Why Use a Reflex Strainer? The Reflex Suction Strainer is the only solution to managing the first line of defence for pumps, both safely and cost effectively, in harsh environments around the world. Only Suction Strainers in the world that can be twisted to clean! Dewatering around heavy machinery has never been more efficient or safe. Save your pumps, increase productivity and improve safety for your employees. Mining/Quarrying – Excess water, underground sump management, exploration drill mud, sediment tanks, wash bays and sumps. Tunnelling and Construction – Removal of water from high traffic dangerous locations. General Agriculture – Cleaning tanks, motor oil, contaminated fuel/oils and chemicals. Irrigation – Farmland water movement from dams, rivers and channels. Drilling/Bore holes – Easy to use inside bore holes with no impact from hard or saline water. General Industrial – Sumps and separators, wash bays, pits, fuel tanks, paints, solvent and ink, contaminated water/effluent and flooding. Commercial – Grease traps, septic tanks, portable toilets, toilet blocks and green waste. Local Government – Sewage treatment plant maintenance, sewer wells, bulk sewage and water treatment plants. Federal Government – Defence (military field engineers, naval general operations). Food Processing Facilities – Food grade and drinking water quality compound (EPDM) for use in the food processing industry for non-contamination (no rust or paint required). Petrochemical Industries – Resistant to fuels and oils allowing easy use and clean. General Marine – Bilge pumps (no rust and no scratching surfaces). Benefit statement: The Reflex strainer reduces operating costs by reducing usage and ongoing strainer and pump maintenance, being simple, safe, reliable, flexible and recyclable. Born out of the high demands of the Australian underground mining environment, the Reflex Suction Strainer is designed to survive in hostile and high traffic environments. Moulded from an advanced blend of polymer rubbers, the Reflex Suction Strainer can handle extreme conditions including being run over by vehicles and machinery. The Reflex Suction Strainer costs less than conventional strainers, saving time in cleaning and replacements. Reflex Suction Strainers are safe to use and manufactured in accordance to ISO:9001 . The Reflex suction Hose Tail attachment is designed to work with the Reflex Suction Strainer in harsh, heavy duty, high traffic environments to provide the complete solution to reduced pumping downtime, safer environments and reliable contaminant reduced fluid transfer. The flexible attachment allows for fast and simple connection for the Reflex Suction Strainer to any 2 inch hose, removing the need for metal or plastic connections in suction lines. S&P Industrial was founded in 2014 to pursue the answer to one question: Can S&P Industrial develop a flexible front-line defence for pumps operating globally? From its humble beginnings in a shed hand‑pouring polymers into rudimental moulds, S&P Industrial now manufactures the patented Reflex Suction Strainers utilising the latest injection moulding techniques combined with cutting edge polymers. 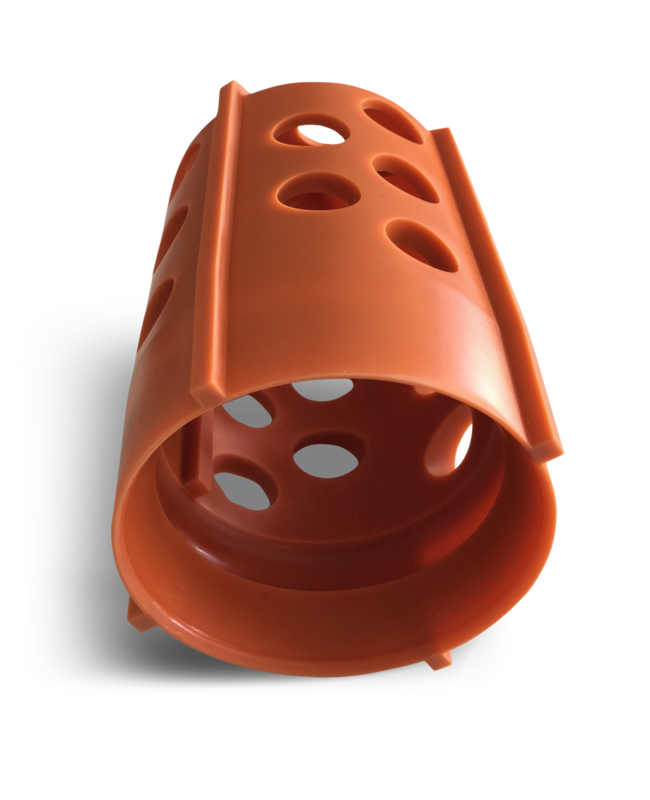 The Reflex Suction Strainers are made from advanced chemically engineered elastomeric polymers allowing the products to operate in extremely harsh environments, including petrochemical, mining, agriculture, emergency services, military, marine and disaster zones. The Reflex Suction Strainers are recyclable and offer additional benefits such as increased safety and pump life and reduced strainer consumption, maintenance interventions and installation costs. In short, the product offers a simple, cost-effective, safe and reliable solution.